This has never been more true than down at The Alleyways Bridport Antiques Centre. So often we hear, “Oh, I should have bought that when I first saw it, not waited as now it has gone”. With 50 traders under one roof, the constantly changing stock means the shop continually evolves. The recent move of traders with in the complex has opened up the rear of the shop and together with improved lighting the displays looking even more inviting. The addition of a couple of new traders has widened the range even further with furniture from Belgium, industrial reclaim, period furniture and Ammonite Gallery with its unique pictures, beautiful clothing and jewellery. Situated near to the centre of town, behind West and South Street, is the Art & Vintage Quarter where you’ll find The Alleyways surrounded by a plethora of artists, sign writers and artisans plus a collection of antique, vintage and retro shops where you could lose yourself and drift back in time. Catch up with friends, enjoy a coffee, lunch or tea at The Red Brick Café. Plus, the unmissable Bridport Vintage Market held every last Sunday of the month when the Art & Vintage Quarter entertains even more antique and vintage dealers and traders. So, next time you’re in Bridport, don’t forget to visit us, we’re sure you won’t be disappointed. 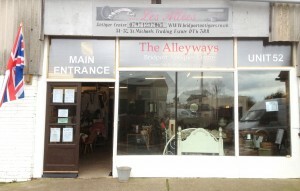 You’ll find The Alleyways Bridport Antiques Centre in the Art & Vintage Quarter on St Michael’s trading estate in Bridport, Dorset. View map. 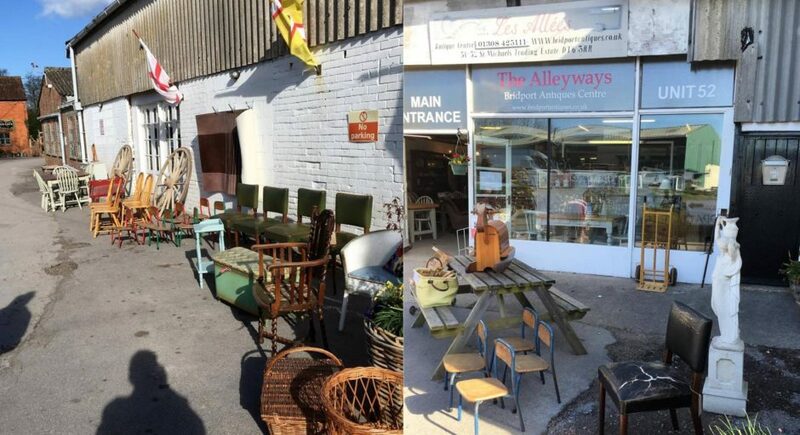 Occasionally there are spaces to let in The Alleyways, if you are interested in hiring a unit in the Antiques Quarter of Bridport please contact Richard or Sam on 01308 425 111 or 07971 237 065 for further information.